Ingredients: Tuna broth, tuna, turkey, sunflower oil, tapioca starch, guar gum, calcium sulfate, tricalcium phosphate, potassium chloride, celery powder, salt, vitamin E supplement, ferrous sulfate, niacin supplement, zinc oxide, thiamine mononitrate, taurine, vitamin A supplement, vitamin B12 supplement, vitamin D3 supplement, manganese sulfate, calcium pantothenate, riboflavin supplement, pyridoxine hydrochloride, biotin, copper amino acid complex, sodium selenite, folic acid, menadione sodium bisulfite complex, potassium iodide. This product is manufactured by Weruva International, Inc. According to our data, this B.F.F. Best Feline Friend recipe provides complete & balanced nutrition for the maintenance of adult cats. In other words, this formula is AAFCO approved. B.F.F. 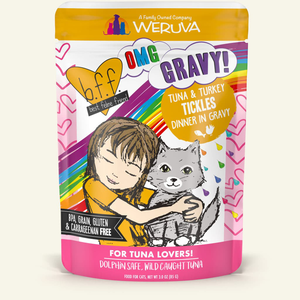 Best Feline Friend Oh My Gravy (OMG) Tickles - Tuna & Turkey Dinner In Gravy is formulated to meet the nutritional levels established by the AAFCO Cat Food Nutrient Profiles for the maintenance of adult cats. We'll begin this review of B.F.F. Best Feline Friend Oh My Gravy (OMG) Tickles - Tuna & Turkey Dinner In Gravy with a detailed discussion of the ingredients. The first ingredient is tuna broth. Tuna broth provides both flavor and moisture; however, as with other broths, tuna broth does not provide any notable nutritional contribution. The third ingredient is turkey. Turkey is another excellent protein source. As with other raw meats, turkey contains a substantial amount of moisture and therefore the relative meat contribution of turkey is dramatically reduced after cooking. The fourth ingredient is sunflower oil. Sunflower oil is an omega-6 fatty acid source. Unlike other oils (flax, canola, etc), sunflower oil does not provide omega-3 fatty acids; However, the balancing omega-3 fatty acids are most likely supplied by another oil or fat source. Because ingredients are listed in order of pre-cooked weight, the remaining ingredients in B.F.F. Best Feline Friend Oh My Gravy (OMG) Tickles - Tuna & Turkey Dinner In Gravy are not as important as the first five ingredients. However, collectively they still have a significant impact on the overall quality of the product. Therefore, we'll continue discussing the remaining ingredients in this B.F.F. Best Feline Friend recipe. Next we have guar gum. Guar gum (or guaran) is obtained from guar beans which have been dehusked, milled and screened. It's commonly used in wet food products as a thickening agent and provides a notable amount of dietary fiber. The next ingredient is calcium sulfate. 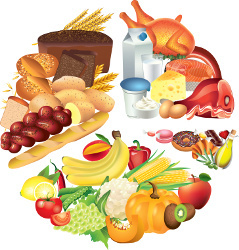 Calcium sulfate is a food additive that helps control acidity levels and functions as a firming agent. It's not a desirable ingredient, but it is considered safe by the FDA in small quantities. Then we have tricalcium phosphate. Tricalcium phosphate is typically used for its mineral contents. However, it can also be used to evenly disperse fat in wet food products. Moving on, we have potassium chloride. Potassium chloride is a potassium supplement. The remaining ingredients in this B.F.F. Best Feline Friend Oh My Gravy (OMG) recipe are unlikely to affect the overall rating of the product. The official PawDiet rating for B.F.F. Best Feline Friend Oh My Gravy (OMG) Tickles - Tuna & Turkey Dinner In Gravy is 3.0 out of 5.